Carmudi Philippines has announced the winner of its third scholarship program, created to help diligent but financially needy students in the Philippines. This semester, the winner of the scholarship program hails from the city of Koronadal in South Cotabato. 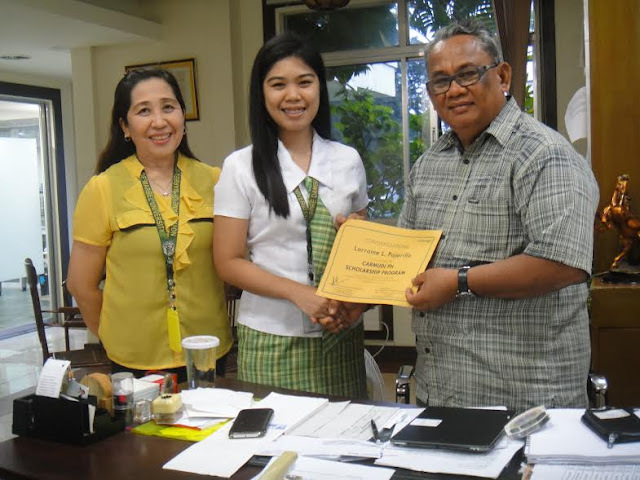 Ms. Lorraine Pajarillo, an Accountancy major from Notre Dame of Marbel University in South Cotabato, has shown diligence and perseverance with regard to her academic endeavors, securing her place as Carmudi’s scholar this term. Carmudi Philippines believes that education plays an important role in the development of an individual and society as a whole. As such, the Carmudi PH Scholarship Program was created to encourage and provide support for academically gifted students all over the country. The program is open nationwide to all 3rd and 4th year college students that have good academic standing. If selected, the chosen scholar will receive a financial grant amounting to PhP 30,000. The grant can be used to pay for school tuition and other academic fees. Ms. Pajarillo is the eldest of three siblings and the daughter of a bank employee and a housewife. With her father being their family’s only source of income, she has taken the initiative to buy and sell books in order to help her parents cover some of the expenses at school. Currently, Ms. Pajarillo is in her 7th semester and is about to graduate as one of the top students in her batch. She has consistently excelled in her studies and has always been at the top of her class. She has also consistently made it as a dean’s lister and will be a remarkable candidate for Latin honors when she graduates next year. Aside from having excellent grades, Ms. Pajarillo has also been known for her co-curricular and extracurricular activities. This is evidenced by her participation in a team that competed against larger schools and popular universities in a national scientific investigatory contest. Her team’s project about the effects of coconut, bamboo, cogon grass and banana tree on blood clotting won them the award. Aside from that, she has been a member of the Girl Scouts of the Philippines and is also one of her school’s top competitive debaters that has seen her participate in many debating competitions. Moreover, Ms. Pajarillo has also been active in extracurricular activities such as event planning for her school. This balanced life inside and outside of school has made Ms. Lorraine Pajarillo the recipient of this semester’s Carmudi PH scholarship grant. With her hard work and dedication to her studies as well as her versatility in activities in and out of the classroom, we hope that she will inspire and serve as an example to other students and encourage them to do their best in their studies and the career they choose to pursue.